The Rat King is certainly one of the more interesting exotic weapons in Destiny 2 and in this guide I'll explain exactly how to get this weapon by completing "Enemy of my Enemy" and solving the "Rat King's Crew" riddles therein. Before we start, it comes as now surprise that players want to get their hands on the Rat King weapon. Although it's a sidearm, and I hate sidearms, it has two of the more interesting perks in the game. First it turns players invisible following a reload, which in itself is pretty cool, but secondly, it has a stackable perk which increases the weapon's power multiplied by the number players in your fireteam who have it equipped. For these reasons, it's worth attempting the quest steps below with your fireteam, especially if that fireteam also works together on Raids. If you all complete the exotic quest together, then the Rat King's exotic perk, "Rat Pack", will be immediately available to you. By now you may have come to realise that the best quests in the game are only unlocked once you complete the main story and reach Level 20. I wanted to mention this part though because not everyone who reads this will have got that far. No spoilers, but once you complete the main story a brand new location is unlocked and a number of different quests become available on each of the games planets. 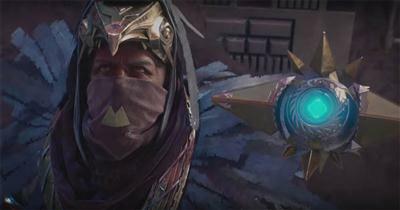 For this particular exotic quest, we want to focus on Titan. 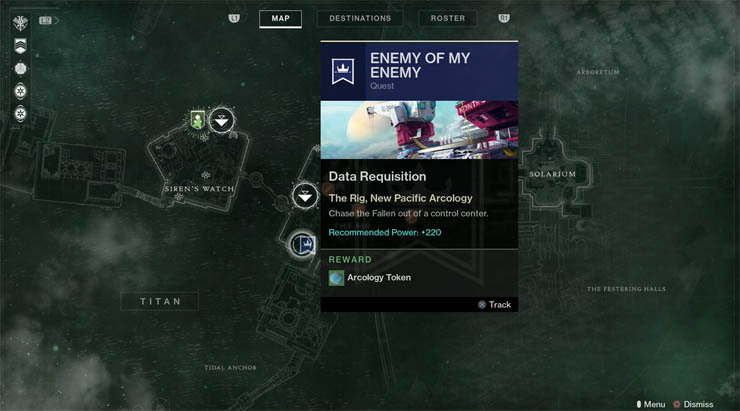 Open the director and head off to Titan, the games smallest patrol zone. Land at the Siren's Watch Landing Zone and immediately head towards Sloane, the faction NPC there. She congratulates you for your victory and presents a new quest called "Enemy of my Enemy". 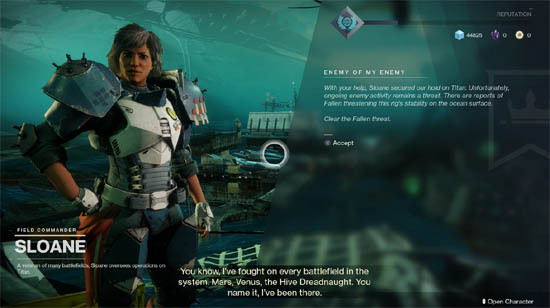 The first quest given by Sloane, called Enemy of my Enemy, sets you on your way to fighting the Fallen. 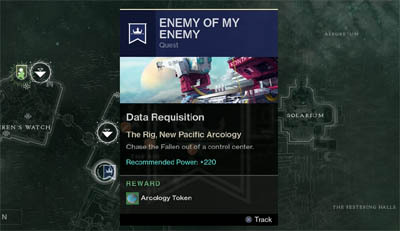 She explains that "There are reports of Fallen threatening this rig's stability on the ocean surface", Take note of the reward for this quest, an "Arcology Token". Head off to fight the Fallen across three separate areas, which are actually one mission when combined. As a reward for completing this quest you should receive a metallic rat skull. Inspecting the new item shows that the description is a poem or riddle that players must solve. The riddle itself relates to activities in the game of course. Now commences a series of riddles and challenges that you must fulfill. Read the poem carefully each time and complete the activities required. In total there are four riddles and hence four steps to complete this exotic quest. You must complete each step in a fireteam i.e. with at least one other person playing alongside you. "The Rat Kings Crew/ Runs to and fro / Good girls and boys / know where to go / Pick up your toys and darn your socks / On errands of woe, on errands we walk"
Objective: Complete three patrol missions. "The Rat Kings Crew / Goes arm in arm / To fight as one / To do no harm / So have your fun and run outside. Rally the flag and we'll never die"
Objective: Complete two public events. "The Rat Kings Crew / Goes four and four / With good good fights / They learn to score/ Then three as one they stand upright / Return from past the wall and wanting more"
Objective: Complete two Crucible matches (win or lose, it doesn't matter). 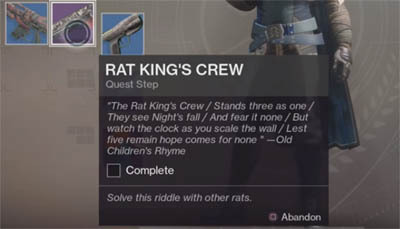 "The Rat Kings Crew / Stands three as one / They see Night's fall / And fear it none / But watch the clock as you scale the wall / Lest five remain hope comes for none"
Objective: Complete Nightfall with at least 5 minutes remaining on the clock. Remember you must reach Power Level 230 before the Nightfall becomes available. 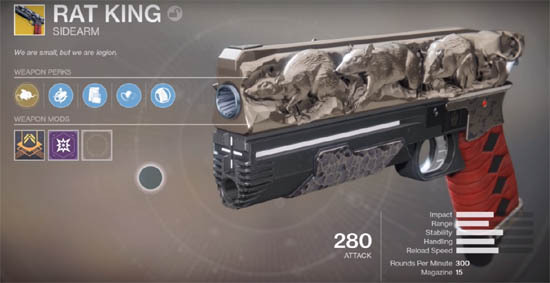 Once complete, the artifact immediately changes into the actual Rat King weapon itself. Vermin - go invisible by immediately reloading after a kill. This invisibility lasts for roughly three seconds, which is more than enough time to deal some surprise damage or flee for cover. Rat Pack - This weapon becomes stronger when nearby Fireteam members also have it equipped. Stacks up to 6 times.